After Pandit Nehru, I think it is only Modi, who has the same kind of leadership and charisma. He has the courage to take both popular and the not so popular decisions. I like how decisive he is. To some extent, I think, Indira Gandhi had the same working style. I remember how she took the decision to abolish the privy purses in 1971, with the 26th amendment to the Constitution. Of course, there is a flip side to being too decisive, it can turn into rigidity if one is not careful. Narendra Modi needs to be careful and balanced if he gets a second term as the prime minister. I would love to see him get a second chance in 2019. I see no other leader, who can stand up to Modi. Rahul Gandhi needs to better himself many times over to be taken seriously as a potential candidate for prime ministership. Having said that, there are some things that Modiji needs to take care of if he gets the mandate. He needs to take care that he doesn’t just limit himself to being a ‘ghoshna naresh’ (king of big promises and announcements). He should fulfil the promises he made to people or else people will stop trusting him. The Indian electorate is very astute. 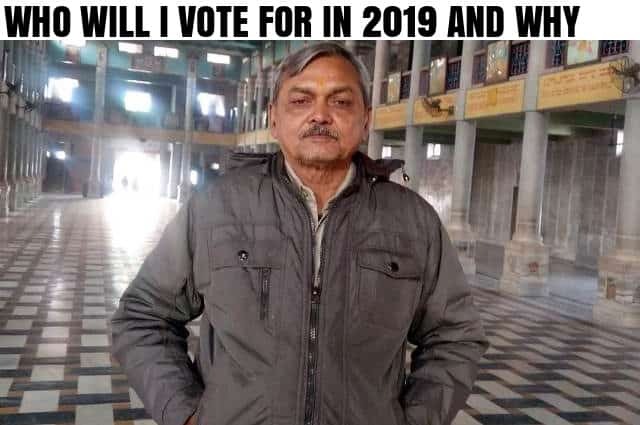 A certain section of the society is not happy that he has not followed up on his promise about the Ram Mandir in Ayodhya. Artists like me feel hurt that he only talks about curbing cow vigilantism, but does not act on it. As a pensioner, the price rise in petrol costs and the subsequent rise in prices of perishable items like vegetables etc. do pinch my pocket, yet being a part of the middle-class, we have been making adjustments almost all our lives. Also, Modiji should think several times over before taking a step like demonetization. I was preparing for my daughter’s wedding when the announcement was made and had a very difficult time organising her wedding and paying off everyone. I think it was purely a political strategy, rather than an economic one, that was played out keeping the then UP elections in mind. Recently the government announced 10 percent reservation for the economically weak among the upper castes, but what use is it if there is no job creation? Practical legislations are the need of the hour. However, I feel Modi has done some good work as the Prime Minister. People now take cleanliness way more seriously. Modes of public transport like buses and trains are cleaner — one doesn’t shudder at the thought of undertaking long journeys. The seed of being sincere towards taking care of the country has definitely been planted in the minds of youngsters. However, end to end waste management still needs to be taken care of. That is something that should be focused upon in 2019. Some members in Modi’s cabinet, such as external affairs minister, Sushma Swaraj and defence minister, Nirmala Sitharaman have thoroughly impressed me. I love how they conduct themselves without any fear. I am impressed by the way women are taking centre stage in Modi’s cabinet. When I hear people say that there is an atmosphere of hatred that has been created, I feel that they are just jumping to conclusions, without going in-depth. I have many friends in the Muslim community and we have no problems with each other. We participate in kavi sammelans and mushairas and enjoy being together. Yes there are people who kill others in the name of religion (lynchings), but in my opinion they are not representatives of Hinduism, rather they are anti-social elements who deserve to be punished. There’s a lot of love in this country of ours and I am proud that as an artist I have been able to spread love among the people. In 2019, I want a balanced country; a country that is strong both on the outside and inside; a country that values both modernity and tradition. People, who will vote this year need to be careful not be swayed by fake news that is being spread around these days. I personally try to keep myself well-informed, so that I am able to take the right decision when the time comes.